Some online slots are obviously five reel machines and some are clearly three reel machines but occasionally a new design comes along which could be described as both. 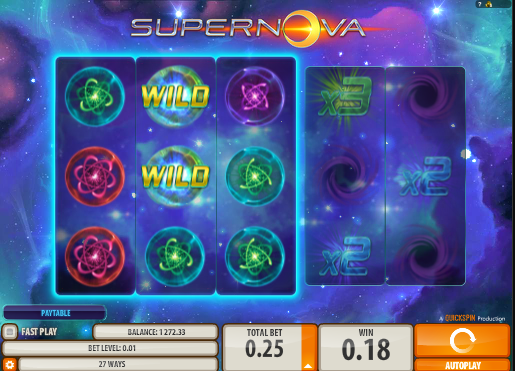 Supernova is a relatively simple new slot from the Swedish Quickspin game studio, a new company which already has some stylish slots under its wing. Some years ago there was a different slot called Supernova based on astrology, star signs and the like but this game is purely space related with a number of astronomical and alien-looking symbols. There are three main reels on which to spin winning combinations and two extra reels containing a selection of multipliers and black holes. The background is a multicolour star-scape with drifting stars; if you land a winning combo the scene changes into a Star Trek- style warp speed graphic as you pick up speed. All the symbols are beautifully animated and there are just six; the three low value ones are coloured helixes while the higher value ones are exploding supernovas, the most valuable being the orange one. There’s also a glowing wild symbol. There is no bonus game in Supernova but much of the attraction is based on how the two sets of reels relate to each other. The relatively low numbers of symbols on just three reels means there are plenty of small wins on the twenty seven paylines. If you do land a win (and it seems to happen a lot) the second set of reels come into play; the first reel spins and hopefully you’ll land on a multiplier rather than a black hole. The multiplier choices are 2x, 3x, 5x and 10x and if you land on one your win is multiplied by that amount; additionally you can now win a second multiplier on the second reel. The multiplier section is over if you fail to grab a bonus on the first reel. Supernova is a classy slot machine from Quickspin and we look forward to many more from this relatively young company. Players can bet from from €0.25 to €50.00 on the 27 fixed paylines with a possible jackpot of 50x the stake.